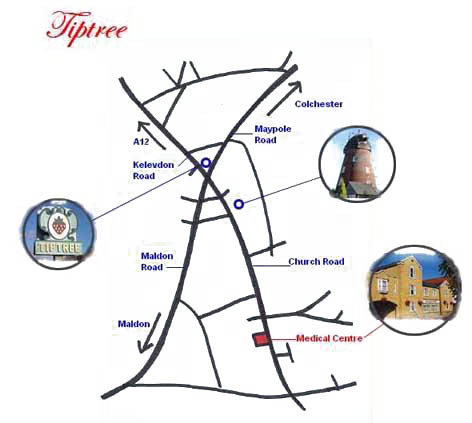 The practice is located on Church Road in Tiptree, near to Tesco. For problems that do not need a face to face consultation you may find it convenient to ask your GP a question on line. Simply sign in at the link below and we promise to reply to you within 48 working hours. Unfortunately we cannot reply via email to you because although we have secure email we cannot be sure you have. Please make sure you leave us a contactable telephone number. If you have an administrative query you may find it convenient, rather than telephoning us, to ask your a question on line. Please email us at the link below and we promise to reply to you within 48 working hours. Unfortunately we cannot reply via email to you because although we have secure email we cannot be sure you have. Please make sure you leave us a contactable telephone number. If you cannot attend an appointment for any reason please inform us as soon as possible in order for us to give the slot to someone else. We have a dedicated telephone number where you can cancel appointments you no longer want or cant keep. Simply text your name and date of birth with appointment details to 07856 218559. Please note this phone is for cancelling appointments only and is never answered. Alternatively press option 4 from when calling the surgery, leaving a message with your name, date of birth and appointment details. If you are not happy with the response from this practice, you can refer your complaint to the Parliamentary and Health Service Ombudsman who investigates complaints about the NHS in England. The Ombudsman acts independently of both the government and the NHS The service is confidential and free. There are time limits for taking a complaint to the Ombudsman, although she can waive them if she thinks there is a good reason to do so. If you need any help or advice to make your complaint to the Ombudsman you can contact your local Independent Complaints Advocacy Service (ICAS). ICAS provides independent advocacy for people who have a complaint about the NHS. Your local adviser can be contacted on 0845 456 1083. Please note that Dr Turner & Partners keep strictly to the rules of confidentiality. If you are complaining on behalf of someone else, the practice needs to know that you have their permission to do so. A letter signed by the person concerned will be required, unless they are incapable of providing this due to illness or disability. PALS provide a confidential service designed to help patients get the most from the NHS. PALS can tell you more about the NHS complaints procedure and may be able to help you resolve your complaint informally.